TICalc.org's Program Of The Year polls are open! For the TI-83+/84+ category, it looks like a bunch of older projects split between two authors-- myself and squidgetx (ticalc profile). Up for the vote are the following programs (in the order listed on ticalc.org). Batlib is a huge library for BASIC programmers. It has 120+ functions mostly for graphics and string and data manipulation, list and matrix manipulation, compression, and much more. Embers is an ARPG that won Omnimaga Contest 2012. This was a really well put together game. It features good graphics, good AI, and storyline. Floatlib is an app that holds many single-precision float routines from addition to hyperbolic tangent. It comes with a built-in reference manual and there are some examples like computing the Mandelbrot Set. Gravity Guy is "a port/variation of the popular iphone/flash game" of the same name. You basically get to flip the direction of gravity to help navigate obstacles. StickNinja was an Omnimaga Contest 2011 entry that earned 3rd place. It's basically a platformer with awesome Stick Figure and Ninja graphics. Collect coins, destroy enemies; It's got it all. 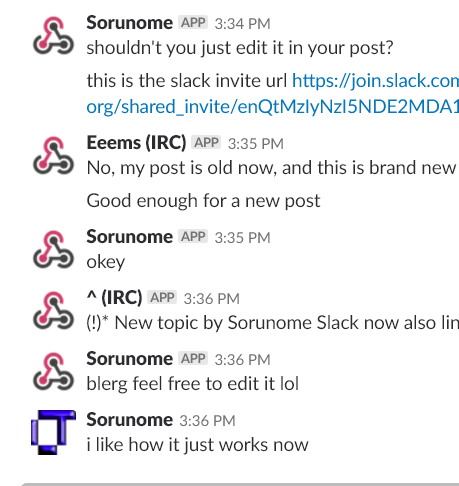 Do you perhaps prefer slack for communicating? Come join us on slack! The chat is linked with IRC, matrix, discord and the webchat! Most of you don't realize this, but we have a Matrix channel and a Discord server. For those of you who aren't as interested in joining our IRC server, our EFnet channel, or using OmnomIRC on the site itself and would prefer other options. You now have even more options. Feel free to grab Riot.im or another Matrix compatible chat client and hop onto #omnimaga:sorunome.de. If you'd prefer to use Discord feel free to join our server. Whether you use Omninet, EFnet, OIRC, matrix, Calcnet or Discord your messages will be synchronized between all the channels. Looks like something went wrong with our .htaccess file and the redirect for articles wasn't working correctly. I've rectified this, you can now get at articles again here. Page created in 0.075 seconds with 46 queries.